Neil Lock has a background in mathematics and software development. It is therefore no surprise that Neil is an early adopter of the current wave of libertarianism. The philosophy of freedom is a logical system that does not tolerate contradictions. True to form, Neil’s book “Honest Common Sense” contains a rigorously methodical and systematic exposition of this philosophy. Lock has built his book on the four humanities metaphysics, epistemology, politics/ethics and economics. As he has aimed his book at “non-academic people” he is not above simplifying these concepts into “be”, “think”, “relate” and “do” and to explain each category in everyday terms. “Honesty” is the centrepiece of his work, holding these four concepts together. In his explanation of these concepts, Lock divides each of them into easily digestible subsections. For example in “relate” he sets out four political principles, which he says are the fundamental rules by which a society ought to be organised: justice, equality, rights and freedom. Interestingly, he ranks them in that order in a hierarchy, one building on the other. He thereby avoids problems that would result from treating each principle equally. Indeed, how would a justice system work if A had the right to judge B only if B has an equal right to judge A? The solution: “justice trumps equality”. How human beings ought to behave within this framework of the four guiding political principles is then set out in Lock’s ten ethical laws. Within the law of truthfulness, for example, Lock discusses the circumstances “where it’s OK to lie in self defence”, and where not, saying: “if justice is not truthful, it is nothing”. The author often bases his ideas on the works of pre-eminent thinkers such as John Locke and Franz Oppenheimer. Commendably however, Lock has the confidence to formulate his own original thoughts and insights. For example, according to Lock, “government” and “political state” are not the same thing, they are in fact “all but opposites”. Neil, who likes to play with words, compares a government with an “umpire” and the state with a “vampire”. Another original thought is when he describes the free market with his “Free Marxet [!] Precept”: From each according to his abilities, to each according to his deserts [instead of needs, as Marx had said]. In another chapter, he goes beyond saying “taxation is theft”. For him, “taxation kills”, because taking property means “taking life”, as “property is life” – it is one’s life’s energy solidified into valuables. His simplifying, but not simplistic, style and catchy phrases make his message very memorable. Lock does not shy away from more practical questions where it matters. He discusses for example whether or not and under which circumstances it is OK to take state money. Basically it is, says Lock, if it is to “take back your own”. You may also accept help if you couldn’t survive without it – but should try to find out who actually paid for the benefits and thank them. State paid jobs are also OK, as long as they would exist in the private sector if the state wasn’t in the way. This is solid advice, especially so as it leaves room for the individual to make up his own mind on each specific matter concerning him. Up to this point there are only couple of minor quibbles I have. One is that Lock sees the immigration debate as an attempt by the state to “shore up their false ‘community’ by concentrating on its walls.” He certainly has a point here. However, this view is one-sided. The other side is the (seemingly contrary) attempt by the state’s ruling class to balkanise its subjects to make it difficult, if not impossible for them to bunch up against the establishment. The other quibble is where he writes that whenever we run out of natural resources, “that’s the time to develop better alternatives”. Here it would have been good to explain that in a free market the price mechanism would drive this development. The book ends with a few chapters more or less devoted to a vision of a free society and the question of “how do we get from here [being the political state] to there [the ‘Age of the Individual and of Civilization’]?” Lock correctly identifies the nature of the current struggle towards this civilization as a “paradigm war”. There are some aspects here however where I depart from Lock more fundamentally. He acknowledges setbacks in our societal evolution towards freedom, but sees us now in a phase comparable to “contractions which precede the birth of a baby”. This may or may not be so – the evidence provided is scant. The bigger problem however is the air of inevitability which accompanies this statement of faith. If something considered as “good” is assumed to be inevitable there will always be some who will want to hasten things along, irrespective of the consequences in the detail: After all, heaven on earth is just around the corner. Omelettes and eggs. To his credit Lock explicitly warns against revolutions “because our enemies are better than we are at violence”. However, on the other hand he hopes that “it shouldn’t be too hard to raise a tidal wave of anger, contempt and hatred, directed at the state, its politics, and the proprietors and beneficiaries of the state. A tidal wave is exactly what we need … it will happen quickly. How long did it take to pull down the Berlin Wall.” Apart from being contradictory, the author is too optimistic here, even if the “tidal wave” he envisages remained peaceful. It is not without reason that German libertarians today talk of their country as being “GDR light” or “GDR 2.0”. Also, the phrase EUSSR is not without foundation. Lock counters by pointing to England’s Glorious Revolution: his almost-namesake and paragon John Locke who in 1683 had to flee from England became in 1689 Commissioner of Excise Appeals. “Paradigm wars do things like that.” Indeed. However, that particular shift was preceded by 150 years or so of Reformation, which planted into people’s minds ideas of individuality and its relationship with the divine. Not to forget the civil war. Paradigm shifts happen, and happen fast, but, like earthquakes, take a long time to build up and a lot of energy and drive to actually happen. This reviewer believes that a societal shift towards libertarianism will need to be preceded by something that changes hearts and minds as much and as deeply as the Reformation did. However, these last few chapters (comprising about 40 of 150 pages) do not lessen the merits of the bulk of Lock’s book. 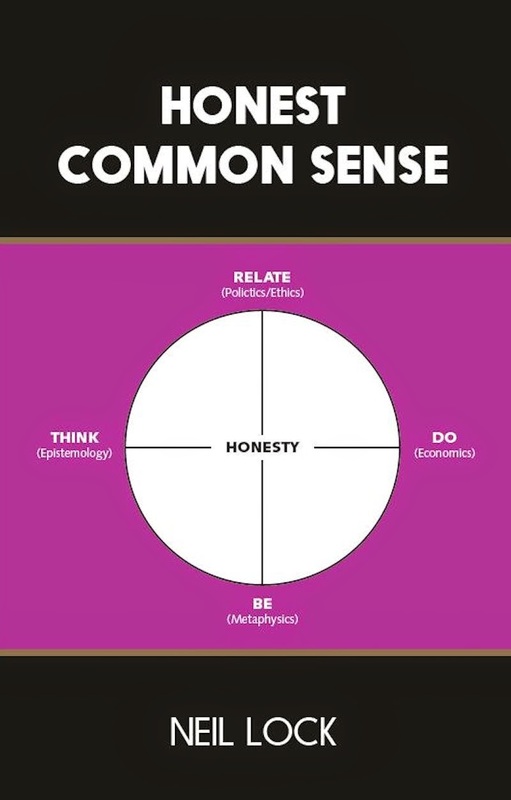 Indeed, “Honest Common Sense” has the potential to be part of the “build up” to the paradigm shift he hopes for. From his book any reader, the seasoned libertarian as well as the novice, can glean many original insights as well as a coherent exposition and overview of the philosophy of freedom. Apart from the above caveats, the reviewer recommends it wholeheartedly.